'Aithe 2.0', directed by Raj Madiraju, has struck an exciting deal ahead of its release. Planet Earth Entertainment has acquired the film's US overseas rights for a fancy price. Says producer Dr. Hemanth Vallapu Reddy, "We are glad that Planet Earth Entertainment, a US-based company, has bought the Overseas rights of 'Aithe 2.0' for a stupendous amount. We are happy to announce also that our content-driven, thrilling entertainer will be distributed by Viswas Cinemas in India." 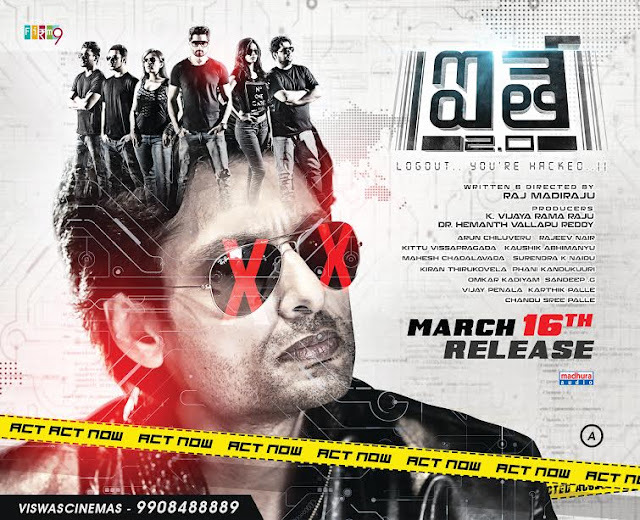 A thriller, 'Aithe 2.0' tells the story of four unemployed engineering graduates and their tryst with the crime world. How the Internet has made us vulnerable in this digital age is what the film drives home through its detailed & tight screenplay. Writer-director Raj Madiraju kept on adding more and more layers to the story in his quest to offer a bonafide, nail-biting thriller. "We are living dangerously. Many news items shocked me when I read them. WikiLeaks is just one example. There are many, many other skeletons in the cupboard. DRDO files have been hacked into by a foreign country, a cricketer's bank account was hacked recently. We are telling you such fearsome stories in our movie," he says. Fittingly, 'Log out. You are hacked' is the caption.